The town trip went well - all missions accomplished. The dermatologist appointment was very quick, I got the haircut and feel much better for it, and got the booklets that go with the stencils printed and spiral bound. Finally. I had them bind some blank pages at the back where I will trace off another set of stencils to make it easier to use. I’ll do that tonight, probably, and put away what I pulled for the next hexagons, a job I never got to the other day. I doubt I will do much stitching but tomorrow I can get back to it. I did little of what I planned last night. A few of the stencils, and I divided the stuff to put away into categories - beads, thread, embellishments. Then I worked on the large crochet basket in progress. I almost finished it. I have two or three more rows and the reverse single crochet edging. That won’t take long and I’ll finish that today. Finishing all of that and doing some housework will make it a busy day. Time to get going on it. Martha, the needle books you pictured were a heavy paper on the outside with thin paper, usually black, where the needles were inserted on the inside. I have several of those, having inherited them from my grandma. Needle books like those were often given away as a business promotion, so would have the business name and info on the back. D, our air fryers are both by GoWise. The smaller one is, I think, the 5.8 quart. I wouldn't go any smaller even for one person, IMO. The small ones are really dinky. The only thing I don't like about it is the nonstick coating has not held up very well, and I was very careful with it. The AF oven is great, too. I can cook 3 pounds of chicken breast in it. It comes with accessories including a rotating basket, rotisserie setup, rib rack, cake pan, kabob rack, plus stuff I don't remember. Also 3 items were in an optional pkg but I don't recall which 3 pieces they were. At any rate, the oven is a lot more versatile than the regular AF. We got both directly from the site. They frequently have good sales. I bought the oven primarily because we were buying precooked chicken breast from the store at almost $4/lb which is ridiculous. We can get raw BSCB here on sale for .99/lb so I knew the oven would pay for itself and it is. I like cooking it up and freezing it for quick meals. I also like it for a quick high protein snack since that's a 0 pts food for WW. We ended up in GR yesterday. My husband is goofy. We go in thrift stores and I'm looking at household stuff, but he runs off to look at gowns, then comes back to report on prices and colors. He's my own personal advance team. At SA, he pointed out where there were gowns so I went to look. Nothing, but a worker saw us and asked if I was looking for gowns. I explained why I was and what I was looking for. She said they had a couple gowns in back she didn't think they would be able to sell, so we went to look. Sure enough, she had one that was beautiful but very outdated. I offered $10 and she was happy to take it. It will make gorgeous angel gowns. 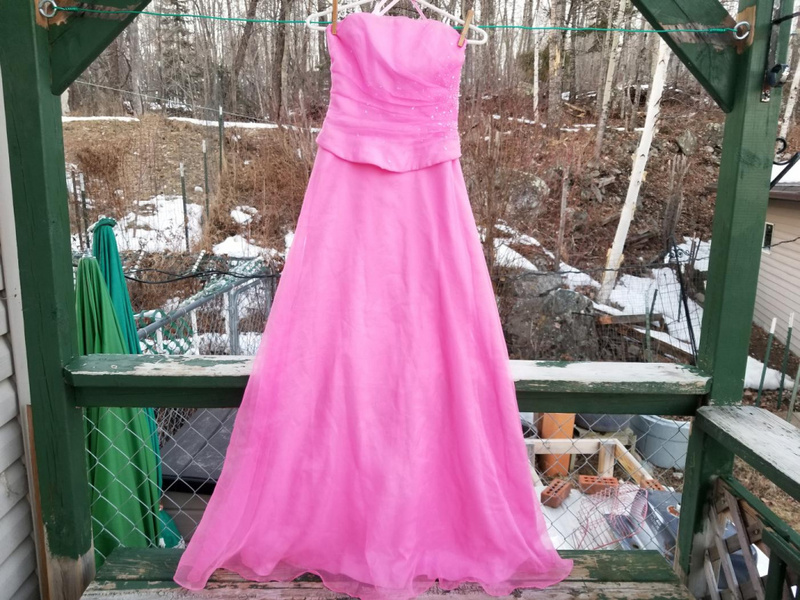 SA gets $10 for something she insisted would never sell, I get a gorgeous gown to make over at a bargain price, win-win. It was marked $150 but it's badly damaged. 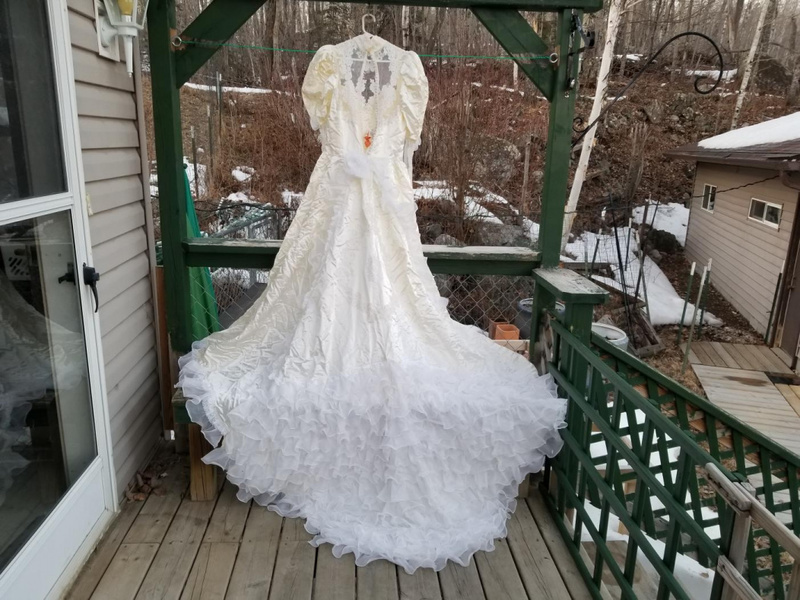 The owner never batted an eye and said that would be okay, but that under no circumstances would she accept any money for either gown. I tried to argue but she wasn't having it. She wanted me to take both gowns for free. I finally accepted and we went to bag the gowns. Then she insisted I take my $3 purchase of 3 antique jar lids for free, too. I kind of wonder if she lost a baby. I hope not. 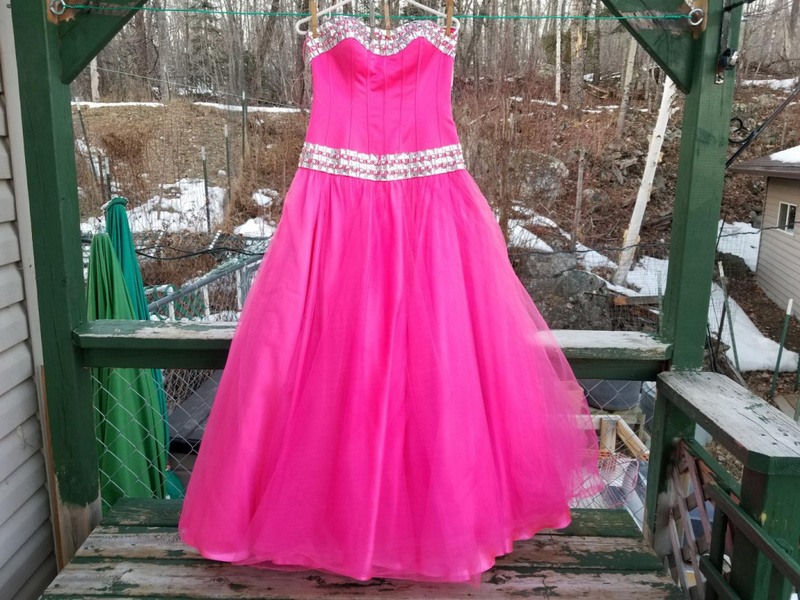 The other pink gown is fairly simple, but will make up nicely. It was marked $40 and I was going to offer $10. The owner had made it clear before we looked she basically didn't care what she got, she just wants to empty out her space. She said to come back at the end of May and see if anything was left, and I could probably take more. They have wedding gowns too, but I was afraid to even look. As a bonus, I got one of those giant hinged gown boxes with the wedding gown. I don't like cardboard storage but it's handy for overflow. I think it will store under the guest bed. I checked prices on those flat totes we got in Duluth because I knew we paid $10 each 3 yrs ago and now they're on WM's site at $22. Sure enough, in store they were $10. The difference, no doubt, is the "free" shipping. I'm still very happy we found the totes at Savers for about $5 total because it still saved us about $15. I'll take that deal any day! The gowns that made me laugh were the day-glo orange ones. The only thing I could think of was traffic cones. They were that exact color. That color must be a thing now because she had quite a few. The one that had me SMH was the camoflage gown. Really? Someone wants to dress up for a formal event in tree bark camo? I am not and never have been a girly girl but that was too much even for me. Anyone know what these are? I got them yesterday in a bag of knitting stuff, mostly point protecters. I think these might be point protectors too, maybe for circular needles. I found everything else online and stopped counting at around $40 worth of stuff. I got the whole bag for $2. I've wanted point protectors for a long time but couldn't justify the cost because I don't knit that much. I also got most of 2 sets of knitting needle keepers, that pair up knitting needles so less digging to find matches. I've never seen those before but I can see I will like them. They matched up all but about 4 sets of my needles. SD - thanks for the info. Those are some great deals. You certainly can’t beat free. I’m taking some time to deal with thread again. I have some that I never put on bobbins, mostly twist type skeins and thread that came in cut lengths, both sort of a pain to deal with. But now I’m using some of them so they need to on bobbins. Some of them are DMC thin one ply wool that I had no idea when I would use them - they came with a thread lot from eBay - but now is the time. I’m deciding I really like the size 8 perle for embroidery and I don’t have much of it. I think I may use the unexpected check I got from the state for unclaimed money (??) and add some, probably DMC. I just looked on 123 Stitch and they have way more of it than I remember. After I go back through the thread pulling out what needs to be wound, I’ll see what I have and what colors I need. 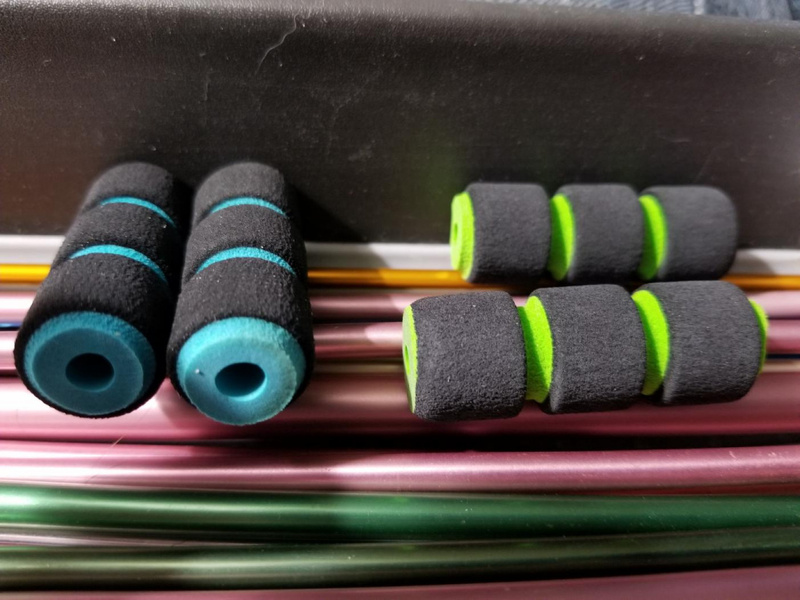 SD - that sounds like a good guess for what those are. D, what about using some thin plastic, like from a milk carton, and cutting a rectangle or oval or whatever shape from that, make holes around the edges with a paper punch, and loop thread through the holes to make a thread palette? Might work better than bobbins. This pic probably won't work, but Amazon has them. Well, I wanted to post the pic but I guess the link above will have to do. SD - I prefer the regular bobbins. Anyway, I have plenty of them on hand waiting to be used. I did order some perle 8 last night - after saying the stash was finished (right). But to my credit I put all the colors that I really wanted - not just wanted because of course I wanted them all - in my cart and then started culling and took most of them out. I ended up with one or two colors for each color family, except for green. There I got three shades of a leafy green and a couple of brighter greens because no project really feels complete unless there’s some green somewhere. I doubt I will make much progress on the hexagon this week because I have other things on the agenda I need to do. I did finish the tall red basket yesterday so there is no crochet in progress. I think there is enough of the red left to make a scarf so I may start that to pick up now and then. cool finds on the dresses spirit deer! yes they are on paper but so cool. I would things were sold to be more decorative like they did in the past. the thin wool thread maybe for darning socks etc. it was common to get in grocery stores until the last decade here. a hank of different colours for mending. Thanks, DLR. Those will cone in handy, too. ... come in handy. Ugh. I am thinking if I had to go to another cite to check the colors, I would rather just order from the cite that printed them out nicely. I will have to think if I really want the Lizbet threat or not. I am spoiled by the free shipping we get with Amazon prime. Amazon does not have good prices on embroidery thread, so I have to order it from other places. If I order from two or three places that is two or three times I pay for shipping. SD, those gowns were a great find. It looks like there is lots of potential for them. Last night were watching some 5 minute YouTube bio of a music performer who was from Indiana. This prompts my husband to google stuff about Indiana. A few minutes later he is saying that Indianapolis has lots of nice things. He follows up with saying he has googled luxury condos in downtown Indianapolis and he feels the prices are within our budget. This kind of threw me for loop. But I guess Indy is now on the list. I looked it up and it does seem to have lots of nice stuff. It is *technically* larger than DC if you are going by the city limits, but much smaller if you go by the metropolitan area. The population density is only about 1/4 to 1/5 of DC, so it should feel a lot less crowded. When I go over to the cost of living comparison for DC v. Indianapolis, I find that the cost of living in Indy is half of what it is here. Half. Well rounded a little, maybe it is 52% or 53%. I had not been considering it before. But looking at it, I wondered why it was not on the list before.